Lakshman Kandhare returned a laptop he found on Monday morning. 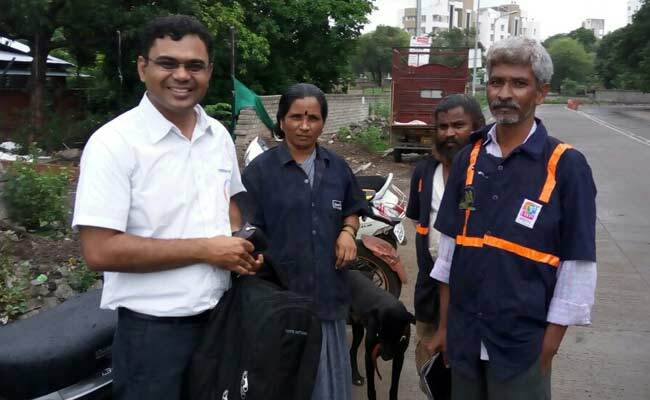 On Monday morning, Lakshman Kandhare, a waste picker from the Solid Waste Collection and Handling cooperative or the SWaCH Seva Sahakari Sanstha Maryadit, Pune, came across a laptop bag as he made his regular morning rounds. What Mr Kandhare did next has earned him a lot of goodwill from the laptop's owner - for he waited and asked around for the laptop's owner. When he couldn't discover who the laptop belonged to, he asked a field coordinator from SWaCH, Gajanan Wadulkar, for help in tracing the owner. After a few phone calls and some help from social media - the laptop was traced back to its owner, Nilesh Choudhury. "I really have no words to thank Laxman Khandare who found the laptop and Gajanan Wadulkar who worked relentlessly to find me, despite having no number or contact details. People would have given up sooner, but here is someone who found it, and made a huge effort to trace the owner," says Mr Choudhury, adding that it saved him not just money but also effort. "From sensitive information to years of work, the laptop holds a very important place in our life." For his part, Mr Khandare is happy that he could help. "We often find valuable items when we collect waste. Knowing that it will be important to the owner we always make an effort to find them. My fellow members have helped find gold chains in Ganapati visarjan items, wallets and bags. I am happy I could help this time," he says.